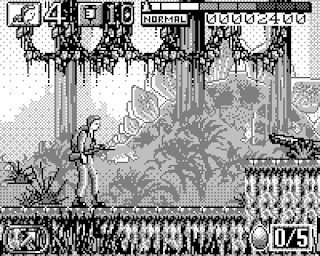 The Lost World: Jurassic Park is an action-platformer that's loosely based on the film of the same name. As Sarah Harding or Roland Tembo, your mission is to navigate six stages of Site B and collect all the dinosaur eggs. The game has two play styles, the first of which are the driving areas where you dodge attacking dinosaurs while heading for the Nest area. I like that there's various vehicles to select, but the severe LCD ghosting makes it hard to see what's happening; this forces you to swerve wildly from side-to-side instead of relying on pure skill. Once completed, you reach the action-platforming areas where you must collect five eggs and locate the exit. A compass points you in the right direction, and Tranquillizer Darts, Flares and Screamers help to warn off younger dinosaurs. The graphics are impressive, but there's no real distinction between the layers, meaning everything tends to blur together, and you sometimes can't even tell where a platform starts and ends! The detailed scenery causes the frame-rate to crawl and button presses to be ignored too; in turn, you'll often fall helplessly to your death, or take damage from a dinosaur you've just tried to shoot. Despite these major issues, the platforming still demands pixel-perfect precision and to top it off many leaps of faith are required to succeed. The game's structure adds to the frustration, as the confusing, sprawling levels appear at the beginning, yet the simple horizontal ones occur later. The finale sees you climbing a cliffside to escape the island, but this fun concept suffers from input lag. The Lost World: Jurassic Park shines in the graphics department, but in truth it's an ill-advised action-platformer on a system that simply can't handle fast-paced motion. Couple this with its copious amounts of technical deficiencies and poor level design and you're left with a sad excuse for a videogame that's bordering on unplayable. 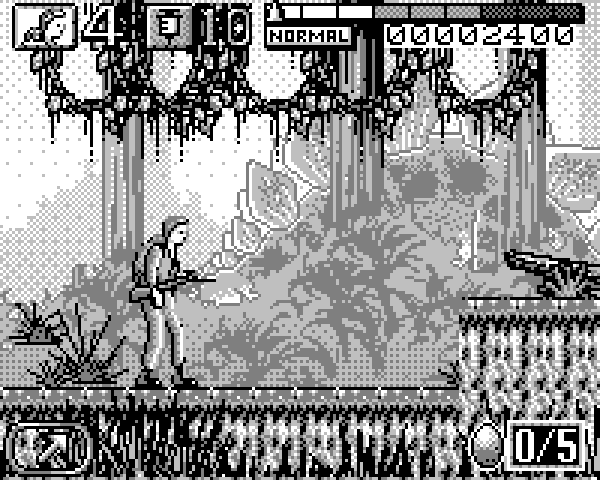 Random trivia: Another version of the game was released on Tiger's R-Zone handheld in 1997.